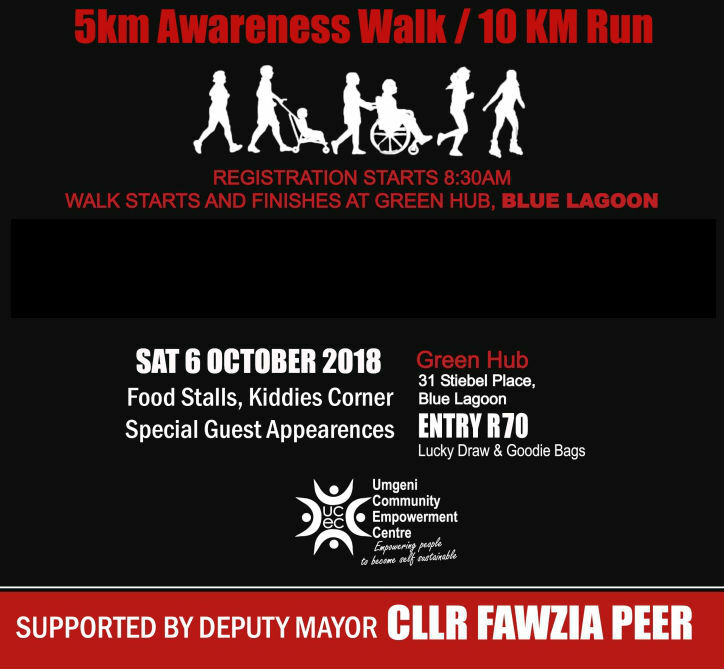 Umgeni Community Empowerment Centre (UCEC) will once again be hosting our 5th Annual Stop Human Trafficking 5KM Awareness Family Walk in partnership with Teleios Events, to bring you a bigger, better and more fun event. It is our pleasure to cordially invite you, your organisation and your family to come walk with us as we say NO to this horrendous crime in our communities. The dual purpose of this event is to raise as much awareness on Human Trafficking as possible and to raise much needed funds for the running and upkeep of our crisis centre, Shiloh House. This centre is used to accommodate and rehabilitate victims of abuse, domestic violence, and survivors of Human Trafficking. Join us for an awareness walk for the whole family!!! Walkers will get a chance to meet, walk/ run with, and take pictures our friendly celebrity guests. The event will showcase Harley Davidson , Roller Bladders,Motor Cycle Clubs, Schools Competition for Best War Cries, Perfoming Artists and food stalls. Kiddies corner will be funfilled with mascots (Ushaka Marine World's Ocean Warriors: Slippy the Seal, Delia the Dolphin, Rusty the Penguin, Raggy the Shark, and the Hollywood Bets Dolphins Mascot, Dolphi), jumping castles, face painting, colouring books and games. Kids will be under safe supervision and they will also be taught about "Stranger Danger" with the help of puppet friends.